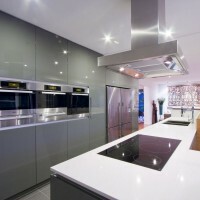 Australian designer Darren James has sent us photos of a completed kitchen remodel project. 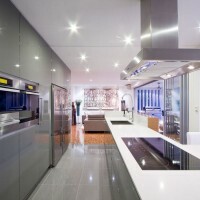 Never in their wildest dreams could the clients have ever imagined the possibilities that existed for their tired, segregated and completely non-functional kitchen. 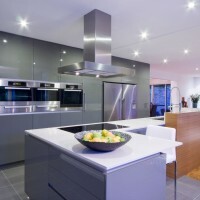 The remodeling of the entire space not only presented the opportunity to create a kitchen that the owners had only dream of, but one that would reflect the quality of the home. The brief was very clear: to create an open-plan kitchen that integrated into the living room whilst still remaining a defined space; provided direct physical and visual access to the newly landscaped outdoor pool and alfresco area without being a thoroughfare; satisfied the requirements of an enthusiastic and demanding gourmand by creating a kitchen that “feels like home” yet still packs a punch for the purposes of entertaining friends and business associates. 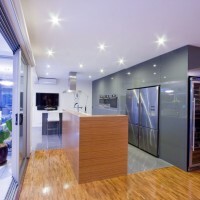 The original kitchen resided at the rear of the home in a small closed in room which bar a small opening remained completely separated from the living room making it virtually impossible for the owners to entertain. To pave the way for the sought after open-plan living the dividing wall that separated the kitchen and living room was bought down – a concept the clients had never even considered until now. The new galley style design required access from several directions. The result is an innovative solution based on a design where the kitchen can be approached from all angles, allowing it to merge with the surrounding living areas as well as offer full view of the beautifully landscaped backyard. The juxtaposition of parallel and perpendicular forms creates a pleasing aesthetic within the room making the most of light and air within the space. At the heart of it all is the large unusual ‘L shaped’ island bench which anchors the utility of the kitchen and provides a solid foundation on which the rest of the room comes to life. As the activity hub of the kitchen, it serves dual purposes of preparation and breakfast bar/casual seating (for the master of the home) as well as providing additional serving space, particularly when entertaining. Finished with a soft lacquered linear timber veneer, the island bench feature adds a sense of solidity to the room and contrasts perfectly with the block colour grey tones used in the remaining high gloss lacquered cabinetry and tiled floor. In addition to providing an interesting textural element to the space, the raised veneer section on the island cleverly conceals the cleaning/sink zone and ensures the preparation mess is hidden from view when entertaining. 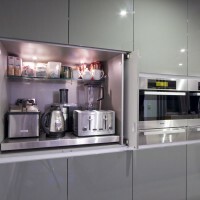 A fully functional ‘working wall’ of cabinets provides the perfect storage solution in a narrow space. Pantry storage plays a major role with a variety of pull out inner drawers. 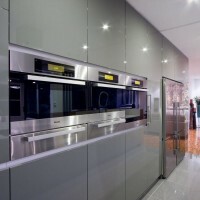 A number of high end Miele appliances have been integrated into the wall enhancing the cutting edge European look whilst also providing all the functional requirements of the clients demanding cooking style. To make the heights of the combi oven and combi steam (including warming drawer) align, a custom stainless steel drawer was designed for under the combi oven. 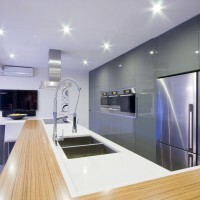 The effect of this is a seamless look, as if the drawer is part of the appliances themselves. Well considered functional details add practicality to the room such as the appliance cupboard where pivot sliding doors cleverly conceal a pull out stainless steel bench top. 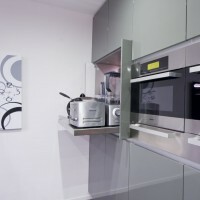 The cupboard serves dual purposes keeping everyday appliances such as the toaster and kettle hidden from view, yet easily accessible whilst also providing another work centre for the client. Elements of the cabinetry extend to the sunroom where a custom made day bed has been incorporated into the existing bay window area creating visual continuity and cohesion. The project demonstrated some design constraints that had to be overcome. 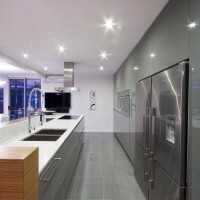 As the house is on a concrete slab there were some initial mechanical challenges reconfiguring the kitchen, as the original layout would significantly restrict what we wanted to achieve. Plumbing was trenched into the slab taking into account the necessary fall for the distance it was being moved and wiring for the electrical was also trenched in to both the slab and the block wall that backed onto the new ‘working wall’. Another consideration was the desire to retain the existing parquetry flooring throughout the home while replacing the old clip-lock floating floor that resided in the old kitchen. 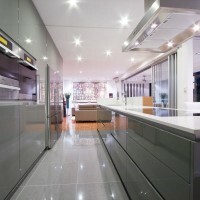 As a solution 600X600 ‘steel grey’ polished tiles were used throughout the kitchen space. Careful placement of the tiles was necessary to ensure visually correct placement delineating the kitchen from the living area, creating a defined space sought after by the clients. 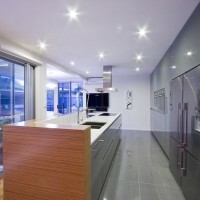 Working closely with the owners the stylized selection of materials and finishes reflects the client’s personal style. 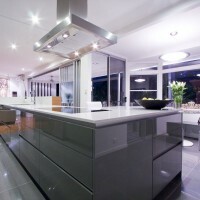 The strong colour palette is functional and elegant and complements the modern lines. The deep charcoals make a dramatic statement and are brought to life by the stark white bench tops and warm timber tones in the veneer. In keeping with the streamlined finish requested by the owners, shadow line finger pulls create a flush finish along the surface of the cabinets and ensure that nothing protrudes into the work areas. 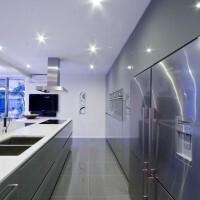 Overhead cupboards have been fitted with tip-on touch catches to maintain the minimal look. 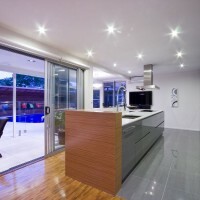 The overall transformation shows what is possible when adaptive design techniques focus on the possibilities within an entire space and not an existing room. 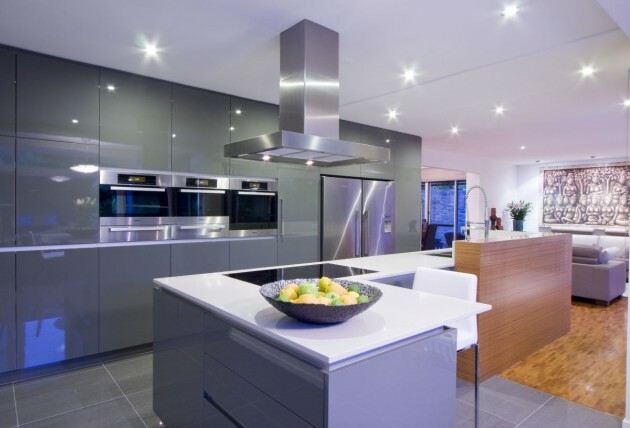 The design reflects the very best in contemporary kitchen design, clever utilization of space through innovative and multi-functional structural elements. A unique approach to the application of materials, colours and textures result in a space that is efficient, attractive and above all else perfectly suited to the owners needs. The owners not only have a light-filled space, but now have all the inspiration they need to gather their family and friends for a meal and entertain in ultimate style. 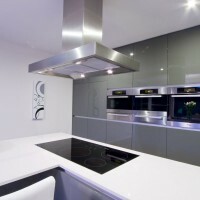 Visit the Darren James Design website – here.